We see lots of addressable LED projects, but there was something weirdly charming and very pretty about this cylinder of squares. It’d make for a lovely interactive nightlight in a kids’ room, or for a grown-up lighting feature that you could also use as a news ticker or something that monitors your in-home IoT devices. Once you’ve built something like this, you’re only limited by your imagination — and it’s nice enough to display in your home. This project is from makeTVee on Instructables. 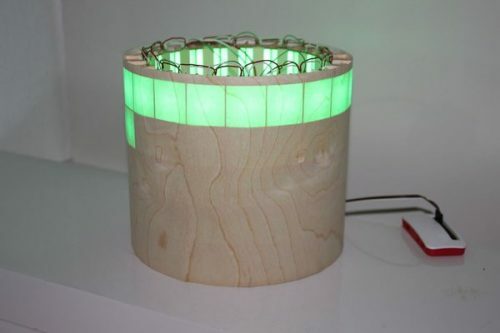 The cleverness is in the layout and the really meticulous execution: vertical strips of LEDs form a cylinder in a laser-cut frame, with a very thin layer of wood veneer glued around the whole thing to act as a diffuser. It’s simple, but really rather beautiful and very effective. 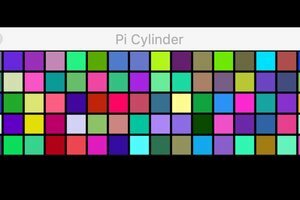 makeTVee has built a Pygame-based simulator of the whole matrix so you can program it to do exactly what you want: scroll marquee text, make pretty patterns, twinkle at random, display images: the world’s your (pixellated) oyster. The code’s available at GitHub. Thanks, makeTVee — if you’d like to leave your real name below, we’ll credit you properly here! Thank you for this feature; it is a great pleasure to see my project here at the raspberrypi.org blog. I am a Pi tinkerer from the very beginning and having one of my projects on your web page has always been a little dream of mine. ;-) So thank you for making it happen! Very nice and innovative ! You'll never use a standard LED again!